Although there is s no official accounting of the number of independent guitar makers working today, a visit to the Montreal Guitar Show seems to indicate that we are witnessing an unprecedented effusion of superfine instruments. 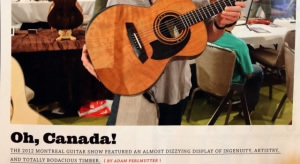 This year, more than 100 luthiers from around the globe gathered to display the fruits of their labor at the show, held in conjunction with the Montreal Jazz Festival, from June 29 through July 1, at the Hyatt Regency Montreal. From Vancouver, the luthier and singer songwriter Meredith Coloma brought a flat top she dubbed Ray. Its back incorporates 17 pieces of naturally multicolored Wood satin wood, bloodwood, rosewood, and ironwood arranged to depict the Japanese naval flag rising above the British Columbian mountains. The threepiece soundboard was made offrom bass side to treble sidecedar, spruce, and fir. "This isn’t just for show but for sonic purposes as well,” Coloma explains. “I wanted to get the perfect tonal separation between registers." Some curious wood selections were also seen in the electric room. Marylandbased artist Peter Malinoski is apt to complete his sculptural solidbodies with colorful opaque finishes, but this year he handrubbed his Ramrod #112 with oil to show off its body of Douglas fir reclaimed from the rafters of a local Twenties era bungalow, a wood whose figuring was so intense it appeared to have been rendered with a Sharpie. And Nic Delisle, the luthier behind Montreal’s Island Instruments, displayed a trio of awesome modern electrics based on department store models from the Fifties and Sixties. The guitars featured unusual wood choices that included cedro espino recovered from the Panama Canal, black locust, and curly cherry. “I prefer to work with ethically sourced and reclaimed woods," Delisle says, “but when I use an exotic wood like ebony, I donate a portion of the proceeds to Taking Root," a reforestation initiative in Nicaragua. In an altogether different direction, German guitar builder Jens Ritter covered his Solidalderbodied Princess Isabella with an intricate brocade of dragons that he procured in a London fabric shop. Michihiro Matsuda, the Oaklandbased luthier celebrated for his breathtakingly modern acoustic designs, displayed a parlour guitar sporting a blackened spruce top and handmade tuning buttons resembling those on a shamisen, the traditional three stringed Japanese instrument. A generous spirit of cooperation could be seen between certain luthiers. The Canadian builder Marc Saumier harvested the woods for the very organic looking cherry and red spruce Hattop and archtop guitars he presented. Saumier gifted the New Hampshire based archtop artist Erich Solomon with a portion of the spruce, which wound up as the soundboard of Solomon's Imperial, a lovely 16inch with curly koa back and sides and a special buttend tailpiece that Solomon designed in 2006 as an improvement on the conventional component. 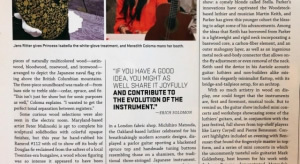 “Several times I've come up with an entirely original idea only to discover that someone else had done practically the same thing 200 years before,” says Solomon, who gave his fellow luthier Randy Muth permission to appropriate the tailpiece, as seen on the Ascent, an innovative cutaway Hattop that Muth brought to the show. Ken Parker, the electric guitar pioneer, now handmakes state of the art guitars that re-imagine the classic acoustic archtop. As he has most years, the artist displayed one at the show: a comely blonde called Stella. Parker’s innovations have captivated the Woodstock based luthier and musician Martin Keith, and Parker has given this younger cohort the blessing to adapt some of his advancements. Among the ideas that Keith has borrowed from Parker is a lightweight and rigid neck incorporating a basswood core, a carbon fiber element, and an outer mahogany layer, as well as an ingenious metal neck and body connector that allows on the fly adjustment or even removal of the neck. Keith used the device in his Auriole acoustic guitar: luthiers and nonbuilders alike mistook this elegantly minimalist flat top, with its bridge and tail piece setup, for an archtop. With so much artistry in wood on display, one could forget that the instruments are, first and foremost, musical tools. But to remind us, the guitar show included mini concerts and workshops showcasing some of the luthiers’ guitars, and, in conjunction with the jazz festival, full shows from topshelf players like Larry Coryell and Pierre Bensusan. Concert highlights included an evening with Bensusan that found the iingerstyle master in top form, and a series of mini concerts in which the uncommonly tasteful solo guitarist Mark Goldenberg, best known for his work with Jackson Browne, demonstrated Matsuda's parlor and Solomon’s Imperial as well as electrics by Winston Joseph and Harvey Citron. The wizardly Bill Frisell, in town to play the jazz festival, stopped by the guitar show to give a workshop. To supplement a discussion on how he discovered a world of music through the Beatles, Frisell regaled listeners with a beautiful unaccompanied rendition of the group’s song “In My Life,” complete with a noteperfect adaptation of the originals harp sichord solo. When asked about the shiny new guitar he had at hand (a Collings I35), Frisell said, “I’ve got only one wife, but I’m the Wilt Chamberlain of guitars," describing perfectly a condition that afflicts so many of us.